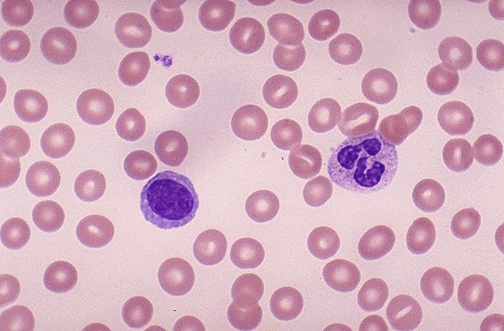 A normal mature lymphocyte with a single large nucleus is seen on the left, compared to a segmented neutrophil on the right with multiple nuclear lobes connected by thin chromatin bridges, along with cytoplasmic granules. An RBC is seen to be about 2/3 the size of a normal lymphocyte. Which of the following survives longer in circulation?